Continuing my series of articles by British Assyriologist Theophilus G. Pinches on Babylon, the following public domain lecture is now available in PDF. Theophilus G. Pinches [1856-1934], “Babylon in the Days of Nebuchadrezzar,” Journal of the Transactions of the Victoria Institute 52 (1920): 178-208. Of all the many and renowned rulers that Babylonia, in the centuries of her long history, possessed, there is probably none who attained a greater reputation than he who captured Jerusalem, and led the Jews into captivity at Babylon. This, of course, made his name one of the most prominent in Jewish history. But in addition to this, he was regarded by them as the great builder, or one of the great builders of the Babylon of later days – that great capital of the ancient Eastern world, described for us, among others, by Herodotus, and specially referred to in the Book of Daniel as Nebuchadrezzar’s work. 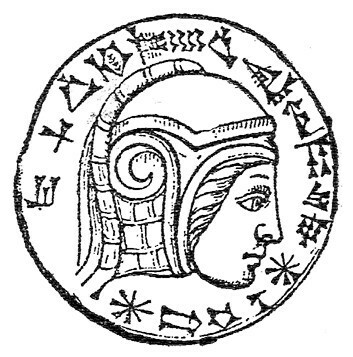 This king, in fact, is represented as congratulating himself upon this great achievement, when, walking about in his palace, he said, “Is not this great Babylon which I have built for the royal dwelling-place, by the might of my power and for the glory of my majesty?” That he should have imagined himself the builder of a city founded at least 2000 years before his time, might well be regarded as the beginning of his madness, but there is no doubt that not a few of its glories, such as they were, were due to him, as many of his inscriptions show. Notwithstanding its reputation Babylon, cannot have been a beautiful city, and many of its most celebrated monuments were more massive than grand. Nevertheless, the Babylonians thought much of it, and looked upon its holy places with poetical reverence. Doubtless much has to be done in the way of exploration before we shall get a really good idea of its extent outside the walls. The portion to which most attention has been paid formed the inner city, and is undoubtedly the oldest part. Here stood the royal palaces, including that in which Nebuchadrezzar is said, in the Book of Daniel, to have been walking when he made the memorable utterance referred to above; and in this section, also, were the temple of Belus (Merodach) and the great temple-tower whose erection is described in the 11th chapter of Genesis. In this portion Herodotus’s statement that the streets of the city crossed each other at right angles, and were interrupted by the walls bordering the Euphrates, does not seem to be confirmed. It is therefore probable that the old city, called Susanna, has to be excepted, and this would only be natural, for it may be regarded as a general rule, that the arrangement of primitive settlements, which developed later into cities, was not done in accordance with architectural plans – generally, they had no architects in those early ages – but were dictated by the contour of the ground. Outside the walls of Susanna, however, some attempt at the arrangement described by Herodotus may have been carried out, but extensive excavations can alone settle that point. An interesting topic, to be sure, but not Nebuchadnezzar! Thanks Don, the link should work OK now.